Your guinea pig will loose some of its hair through shredding. That's why it's a very good idea to have your own little piggy saloon on the bedding in your cage. While it is not that necessary for short haired piggies, it is especially important for long haired guinea pigs and you should do it on a daily basis. Below we've reviewed the best grooming products, that will make daily grooming go from a chore to joy. 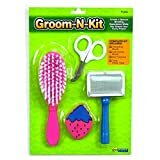 The Kit includes a nail trimmer, bristle brush, pin brush and a wooden chew toy to distract your pet while you groom them. It offers convenience since you don’t have to individually buy the other products that will probably cost a lot more than this whole kit. The nail trimmer has a good set of blades to cut your pet’s nails clean. Also, because of its scissor-like feature, it is easier to hold and there is a lesser chance of it slipping off your hands especially when you have a naughty guinea pig. It is the perfect size for the tiny nails of your pet. The bristle brush is for making your pet’s coat shinier while the pin brush is for removing loose fur and to lessen shedding. Guinea pigs with long coats such as the Peruvian and Shelty will benefit most from the brushes and will need it more often than those short-haired ones. Due to its price, expect that the quality of the items included on this kit will not be the best. However, it is enough for first time guinea pig owners. 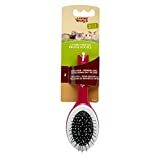 This brush has 2 sides: The soft side that is responsible for giving your pet’s coat a healthy shine and the pin side that helps in getting rid of loose hair and minimize shedding. Unlike the pin brush of the Groom-N-Kit, the pin side of this brush has thicker bristles. Thin bristles can get a little painful for our pets especially those with sensitive skin. However, thinner pins are also more effective in reducing shedding and untangling hair since guinea pigs have fine strands of fur. Aside from the perfect size of this brush, another great feature of this is the way the soft bristles are placed closer together. It’s a more effective design to give that coat a healthy shine because of the type of compact body-type the guinea pigs have. The easy-grip handle and finger rest enables you to have a secure grip on the trimmer while your other hand holds your mischievous and resistant pet. If you have been an owner of guinea pigs or any other small animal for quite a while, you definitely know how hard it gets. It is made from premium quality materials to give your pet a precise and quick trim. The great quality blades help in preventing nail splinters that can wound your pet especially if they scratch a lot. 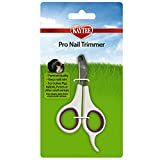 Speaking of scratching, regular trimming prevents nail breaks and can possibly reduce scratching. That is the reason why you should get a great-quality nail trimmer like this one that lasts long and performs well.